Image to the left taken from the East Main Guest House Bed & Breakfast Inn website. This 1916 home is located in Rock Hill, and is a beautiful combination of antiques, art, and pine floors. It has several rooms to choose from, such as the romantic Honeymoon Suite with a fireplace, canopy bed, and whirlpool garden tub. The East Room is a lovely, dignified suite with designer window treatments, and the Garden Room’s windows let in plenty of sunlight and give you a stunning view of the gardens and pergola. East Main Guest House offers a sitting room with a game table, television, and puzzles, and the rooms have Wi-Fi and cable television. A hot gourmet breakfast is served every morning with coffee, tea, juice, fruit, muffins, and croissants. Travel Holiday says that The Governor’s House Inn has the most glamorous feel and most sophisticated style of all the inns in Charleston. A former governor’s mansion, this enchanting inn has the distinction of being a pre-Revolution National Landmark and boasts stunning drawing rooms and verandah porches. Image above taken from The Governor’s House Inn website. The Governor’s House Inn was the residence of Edward Rutledge, the youngest signer of the Declaration of Independence. 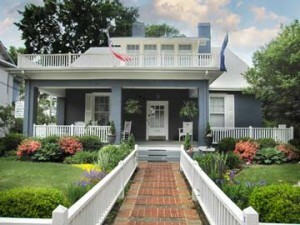 It is located within walking distance of the historic Battery, the Old Market, and the Gibbs Art Museum. Its suites each have a distinctive look and personality. The Rutledge Suite boasts a large master bedroom with canopied 4-poster bed, Italian chandeliers, private porch, and marble bathroom with whirlpool. If you desire, the staff will handle all your entertainment and dining arrangements, and a gourmet southern breakfast awaits you every morning. Should you choose, you might enjoy afternoon tea, wine and cheese, and sherry in the parlor in the evening. If you love the outdoors and cozy cottages, the Red Horse Inn is for you. Located in Landrum, at the base of the Blue Ridge Mountains, this AAA 4-Diamond bed and breakfast is one of BedAndBreakfast.com’s “Top 25 Best Undiscovered Incredibly Romantic Inns.” The spacious Springhouse Cottage has a private deck leading to a relaxing outdoor spa, and mountain views await you from a luxurious king-size bed and tall arched windows. The Carriage Bay Cottage has a romantic loft, fireplace nook, and whirlpool tub. The Red Horse Inn also offers romantic packages that include roses, wine or champagne, and strawberries with dipping chocolate. Your breakfast is prepared before your arrival and stored in your kitchen, ready whenever you are. 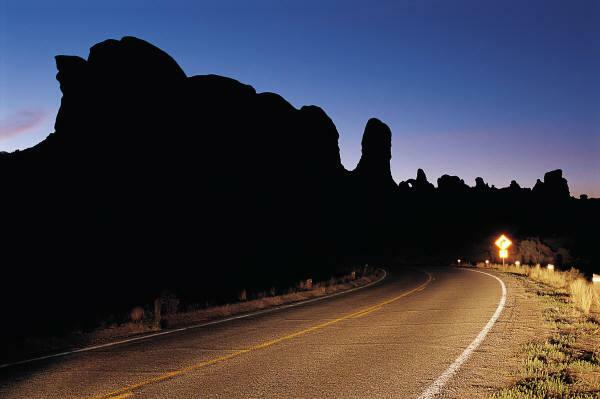 Which B&B would you like to visit, and why? 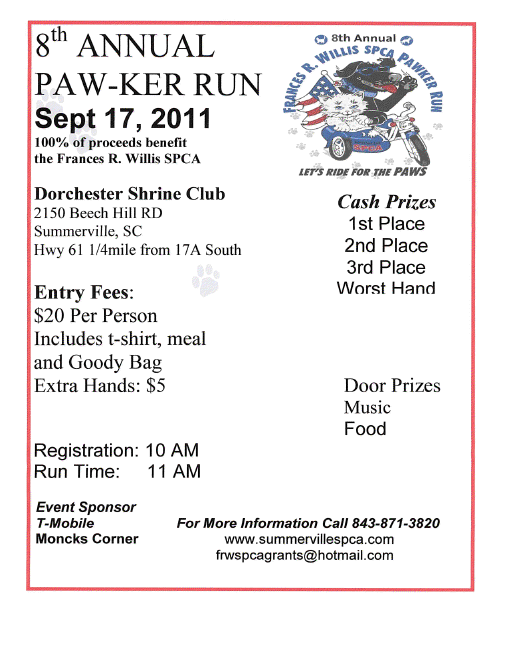 As motorcycle accident lawyers who also love animals, we’re looking forward to the 8th Annual PAW-ker Run to benefit the Frances R. Willis SPCA in Dorchester County, SC. The event will take place on Saturday, September 17, 2011 at the Dorchester Shrine Club, with registration beginning at 10 a.m. The first bike will leave at 11 a.m., and the 100-mile run features 10 stops. The SPCA relies entirely on grants, donations, and fundraisers, and 100% of the proceeds go to the organization. Last year, this run raised $14,000 for the SPCA and had almost 600 bikers in attendance. This year, the estimated number of bikers is 650, and the fundraising goal is $17,000. Previous PAW-ker Runs have helped over 4,000 lost, abandoned, and abused animals in Dorchester County, and the need continues to grow. The entry fee is $20 per person, and includes a t-shirt, meal, koozie, and goody bag. For each extra hand played, the cost is $5. All major credit cards are accepted. Cash prizes will be awarded for first, second, third, and worst hands. A DJ will provide music, and Dorchester Shrine Club and Junior Service League of Summerville will provide a BBQ meal with dessert. Door prizes will be awarded at the end of the ride. Sponsors and support are always needed and are greatly appreciated. The SPCA is a 501(c)3 tax-exempt, non-profit organization, and if you have questions or would like to help, contact Bob Jones by phone at 843-871-3820, extension 205, or by email at frwspcagrants@hotmail.com. The SPCA website is www.summervillespca.com. Let’s Ride for the PAWS!